Collectively, our consultants have over 90 years of experience which means you’re in safe hands. The dictionary defines a consultant as “an expert in a particular field who works as an advisor either to a company or to another individual.” Sounds pretty vague, doesn’t it? A consultant’s job is to consult, nothing more, nothing less, it’s that simple. However, what separates a good consultant from a bad consultant is a passion, a drive for excellence and pride in what you do. At Prospettiva , we only recruit people with real world experience, be that in accounting, logistics, business management or with exemplary qualifications in their focus field. And that’s why, collectively, we can boast over 50 years of experience implementing business software solutions, be that for small business or multinationals. Our commitment to deliver a reference-worthy solution remains the same. Our business analysts are second to none when it comes to understanding the ‘pains’ of your business. That’s because we’ve been helping hundreds of businesses like yours for many years, and during this time, we’ve worked with organisations of all sizes, have learned many common trends and have offered insightful and unbiased advice on how to streamline operations and improve efficiency, often simply by providing a different perspective. Our project managers have extensive experience in managing a variety of projects, from simple software upgrades to major implementations, from scoping the initial project through to go live and sign off. We can either work with your internal project manager or manage the whole process for you, drawing only on your input at key stages. Furthermore, we understand that implementing new business software is not only a major investment for you but it also represents hours of proactive work, a luxury seldom available to busy organisations that’s why we invest a lot of time preparing each project with a thorough scoping exercise which not only ensures that we exceed your expectation but also that our consultant’s time and yours is used effectively to a common goal; deliver the project on budget, on time and to your satisfaction. Some companies are very specific in defining the role of an implementation consultant and that of a helpdesk technician as the definition appears obvious. However, there’s a much similarity between the two. That’s why we believe that if a technician does not understand the fundamentals of how your business software is installed then they can’t possibly be best equipped to help you post go live. All of our technicians are multiskilled with both implementation and helpdesk experience enabling them to diagnose and a resolve your technical queries quickly. Moreover, not unlike other members of the technical team, they come from a ‘real world’ background which means they appreciate the importance of being able to get to the office and on with your day without the added hassle of software errors and or faults. We work hard to get you up and running as soon as we can, and on those occasions where we have to pass your query to the software house, we have a dedicated resource ensuring that your query is regularly progress chased and that you are kept informed at regular intervals. And whilst it may well sound like a marketing line; we truly do not focus on being the biggest but we do focus on being the best. This enables us to provide a personal service to our customers who are more than willing to testify to our customer care. Give us a call on 01223 789 560 and ask us for references from customers in your line of business or take a look at our testimonials page. How much of your working life do you believe has been hijacked by any of the above scenarios? A few hours, days, months? What if you could get away from all that? What if you could reclaim the hours you spend commuting backwards and forwards to the office each day and use this time to actually get things done? Conventional business works on the basic premise of an office, one or more servers (for email, files and ERP software), a network infrastructure (to connect to the server) and client machines (PCs or laptops), and, of course, a phone system. ‘The Cloud’ can deliver all of the above, but as a service, not unlike everyday utilities, such as power and water. Why should a startup business get excited by cloud? Many successful businesses start like acorns: small and growing slowly, they do not have access to vast sums of money to invest in the infrastructure necessary to manage their business. Whatever cash is available is generally used to produce product for sale. The cloud affords any business the ability to be up and running in hours with email, and an ERP solution (to manage stock, finance, invoices, document management and more), all for one, low cost, monthly rental fee. Simply subscribe to the services you require. A minimum subscription period applies (normally one year) but after this time, you can simply cancel any service you no longer require. Now you can avoid huge upfront outlays in hardware and software costs. Invest in producing your competitive product and not in managing it. Welcome to financial freedom by the power of the cloud. But that’s not all. If you’re a startup business and don’t have the money for premises, the cloud enables you and your colleagues to work from the comfort of your home or any location of your choice, even the beach, providing there’s an internet connection! Why should established businesses get excited by the cloud? Because, like any organisation, you have overheads: buildings, cost of sales, rates, utilities and, of course, staff costs. In difficult times like these, every little saving truly does help. Even for a small business, thousands are spent just on servers. Add to this the cost of configuring, upgrading and maintaining these as well as the overall network infrastructure, and IT soon features on the profit and loss report as a major cost centre. With the cloud, there’s no need to outlay thousands on new servers, network infrastructure or expensive software titles. These are all available as SaaS (Software as a Service), including leading ERP solutions such as SAP Business One: an integrated business software solution. SAP Business One normally costs thousands of pounds per user, but it is now available, like most cloud solutions, for one, low cost, monthly rental fee, which by the way includes maintenance. This means that upgrades and maintenance services are all taken care of, so you can focus on what really matters: running your business. Any everyday device of your choice (e.g. PC, laptop, tablet or even a mobile phone), an internet connection, and a subscription to the desired service. Why are we so passionate about the cloud? Because we know how effective the cloud can be at enabling new businesses and streamlining costs for established businesses. How do we know? Because we’re a cloud enabled company and we have helped both new and established businesses to reap the benefits of moving to the cloud. We’ll gladly share our experience with you and offer free advice about how your business can cut its IT overheads giving you that all important competitive edge. Call us on 01223 789 560 or click the link below to submit your enquiry online. Choose freedom – Get into the cloud! The fundamental advantage of Enterprise Resource Planning or ERP for short is that integrating a myriad businesses processes into a single cohesive system saves time and expense for all people in the organisation as well as building a structured platform for business growth. Management can make decisions faster and with fewer errors. Data becomes visible across the organization. Improve quality and efficiency of the business. Support management by providing information for decision making. Create a more agile company that adapts better to change. Make a company more structured so organisations can operate more cohesively, enhancing the business—internally and externally. Manage and distribute documents with ease, efficiency and automatically! Printing documents can be expensive and time-consuming when you factor in the cost of the printer and its maintenance, paper, and ink or toner cartridges. What’s more, the space required for document storage could be considerable. With document management software, you can save both space and money without adversely affecting your business. Document management software gives you the tools to organise, edit and distribute your important paperwork. Both Boyum and Draycir help you quickly store and distribute important documents in standardised formats. The software allows keyword search so you can find documents in seconds, rather than minutes or hours. These and other features make document management software a perfect way to organise your business, cut costs and save time. The internet is over 25 years old and it has just been dubbed of the most important inventions of our time since it has fundamentally shaped who we are as a people. It’s one of the many reasons why companies, such as Facebook, are investing millions of dollars in bringing the internet to some of the most remote places on our planet. It is thanks to the internet and advances in technology that many of us are able to communicate and share information with contacts and loved ones across the globe in seconds. We’re able to start work even before we’ve arrived at the office. Many have gone one step further and actually no longer need to commute to the office to turn in a full day’s work. There’s no doubt that both our social and professional worlds have changed. However, whilst the power of technology may have connected millions of individuals and businesses around the world, we’re finding that many organisations are suffering from business fragmentation; data from multiple departments is stored in different databases, spreadsheets and hard drives. From company servers through to personal inboxes through to different devices, many simply aren’t getting the latest information when it is needed all the time. And in a fast moving, highly competitive world this can spell disaster for some businesses. Worse still, because businesses are often busy firefighting information black holes and fulfilling customer queries and orders there’s often no time for the proactive exercise of finding one integrated solution that enables them to store, share and communicate with team members and business partners in a simple and safe structure. Thankfully, some very successful cloud repository companies have responded to our need to store, share and collaborate on files. Box and Dropbox being just two of them. They, along with a selection of other brands, such as Apple’s iCloud and Microsoft’s OneDrive, enable businesses and individuals to back up and sync between devices important data, such as documents, photos, music and more. However, whilst cloud repositories are highly effective at sharing business documents and data, they stop short of providing one secure, online, fully integrated solution. Such a solution would incorporate all crucial business requirements including a secure company intranet where employees and business partners could collaborate and work together wherever they may be across the world, either in or out of the office via a web browser or their mobile device. The solution would be a place where all crucial business data, such as CRM, leads and projects can be viewed and modified in real time. Enter Podio, by the global leader in telepresence technology, Citrix. It incorporates all of the above and more for a low monthly cost per organisation user, per month. That is users within an organisation and not the unlimited number of collaborators, customers and or suppliers, who can be invited to collaborate on one of the unlimited workplaces for free. Moreover, Citrix Podio integrates with Box, Dropbox, SugarSync and many other online solution providers, and, thanks to Citrix Podio API solutions, it can even integrate to existing ERP solutions, such as SAP or Sage. Citrix Podio boasts hundreds of free apps on its marketplace to manage everything from recruitment through to complex workflows across all business departments. And if an app doesn’t already exist, that’s no problem, users can simply build their own through its user friendly ‘drag and drop’ interface. Data can simply be imported and exported with one click spreadsheets, calendars can be synced with Google Calendar and Microsoft Outlook, and there’s easy integration with leading online brands, such as helpdesk leader, Zendesk. There really aren’t many business challenges that Citrix Podio cannot resolve. And you would be forgiven for thinking that this were just another marketing gimmick but it isn’t. Well, because we’re speaking from experience. Prospettiva has been using Citrix Podio successfully for two years now. We manage all aspects of our organisation via an array of Citrix Podio apps and workflows. All of our projects feature Citrix PODIO workspaces enabling our clients to view and collaborate on project information, such as deliverables, timesheets, issues logs, and project time consumed/remaining, in real time. No need to ask for reports or hunt down the last project update spreadsheet. It’s thanks to Podio that we’re able to offer all of customers complete visibility over what we do. If you’d like to find out more about the benefits of Citrix Podio then take a look at the further reading or further viewing sections below. If you’d like to take PODIO for a test drive using your own real world scenarios then click the icon to get in touch with us, it takes minutes to set up your own demo workspace with some of your own apps and even your own data! Unify your business with Citrix Podio and Prospettiva. Call 01223 789 560 or click here to send us a message. As a distributor you’re probably working with small margins which mean your systems and integration is important to maximise every penny of your investment. It requires careful control of inventory levels, streamlined order fulfilment practices, efficient warehouse operations and dedicated customer service. You need to optimise daily operations for maximum efficiency while minimizing administrative overhead and costs. Add in the need to manage rising costs and shrinking margins, and you’ve got a lot to keep track of. Relationship maps instantly give you visualisation of any transactions in the system. If this isn’t enough then a business dashboard is customizable, and leverages established best practices in providing an accessible tool for monitoring real-time business operations. 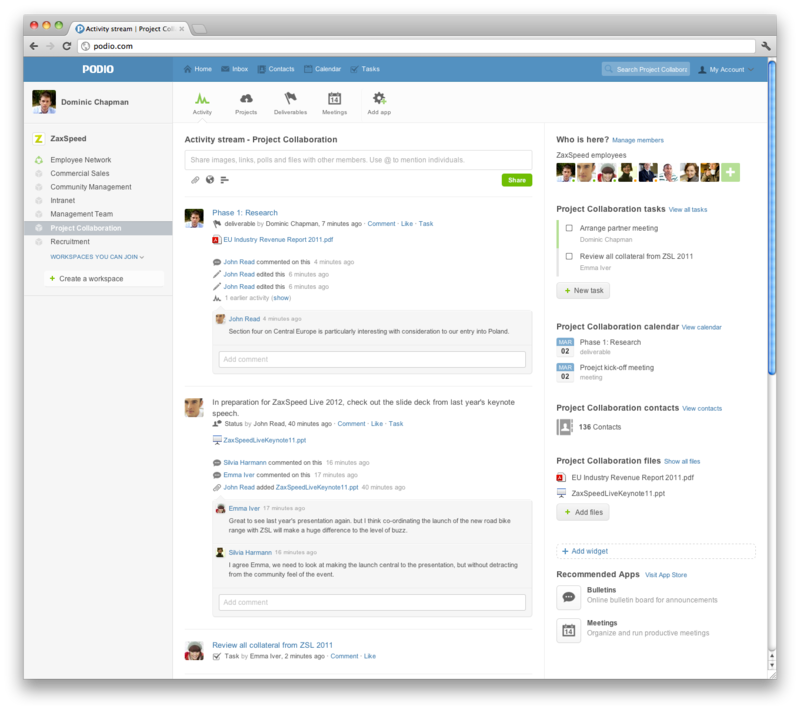 This dashboard can also be tailored to fit certain roles, maintaining a clearly organized business community. Our systems are fully integrated and cover areas such as inventory control, warehouse management, accounting and financial management, order management, customer relationship management (CRM) and ecommerce. The solutions are available as an on premise, cloud hosted or Software-as-a-Service (SaaS). Our solutions can be used to manage production orders, accurate demand forecasting for managing stock levels and restocking. In addition, the system supports inventory for multiple warehousing, bin locations, bill of materials, production order management, bar coding procedures and many other necessary business processes in the manufacturing industry. Our solutions will manage the complete sales/production lifecycle from Opportunities, through sales to production and purchasing. Relationship maps instantly give you visualisation of any transactions in the system. If this isn’t enough then a business dashboard is customisable, and leverages established best practices in providing an accessible tool for monitoring real-time business operations. This dashboard can also be tailored to fit certain roles, maintaining a clearly organised business community.